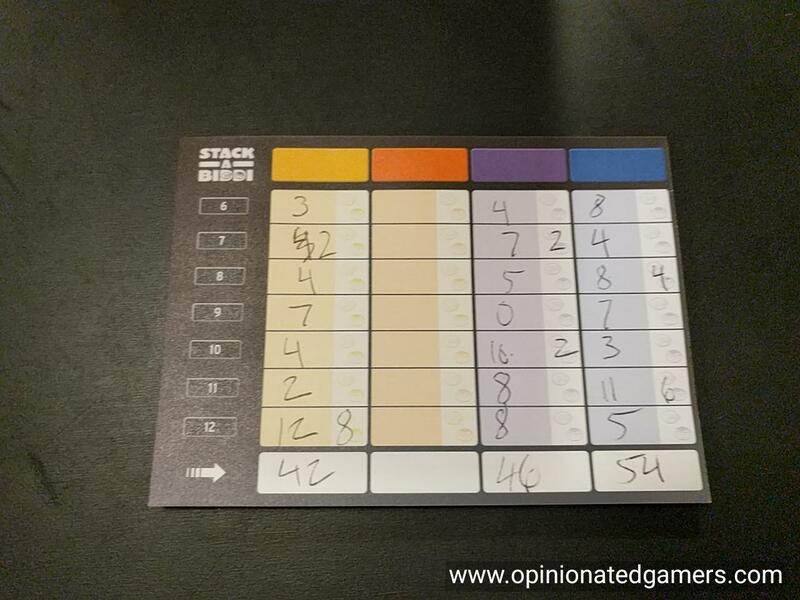 The game is pretty easy to learn, and I was more or less taught the basics while I played my first game. Each player has a set of 8 long rectangular blocks and 4 short Biddis – these are much shorter rectangles in 4 different colors which match the 4d10 in the game (red, blue, white and grey). Each of these rectangles has a wavy line printed on the four longer sides of the block. The Biddis additionally have some faces drawn on them. The game is played over seven rounds, and the score card helpfully tells you that the first round of the game requires a tower of 6 levels, and this increases by one per level until you need a full 12 levels in the seventh and final round. At the start of each round, any player rolls the four colored dice – and ties are re-rolled until there are at least three different numbers shown on the dice (four different numbers required in the final round). If there is a tie, the rolling player chooses which one of the tied numbers is used. The number shown on the die tells you at which level in your stack that you must place the Biddi of the matching color. For instance, if the red die shows “1”, you will have to start your stack of blocks with the small Red Biddi on the bottom. If the number of a die is greater than the number of levels, you simply don’t need to place that particular Biddi in this round. Once the numbers are set, all players start at the same time and race to stack their blocks on the table. The catch here is that the wavy lines on the blocks must be connected in a single path. You are able to choose whichever side of the blocks that you use – and for all levels not specified by the dice, you are free to choose from any of your eight blocks in your color. Your stack must be able to stand on its own at the end of the round, though you are able to balance it with your hand(s) as you are building it. Whenever your stack is complete to the specified number of levels (and with the appropriate Biddis in the right levels), you shout out “Stack-A-Biddi” and end the round immediately. Then, the fastest player is checked to see if his stack adheres to all the building rules. If something is amiss, that player simply scores zero for the round. Now, all players score for the round by scoring one point per correctly built level (From the table upwards). If their wavy line isn’t fully connected, they will score points up until the place where the mismatch occurred. The fastest player also scores one point per level, but also can get 2 bonus points for each Biddi which has a smiling face seen in his stack (no points for unsmiling faces or upside down faces). The game then moves to the next level. Every is reminded of the number of levels needed for the next level, and the dice are re-rolled. The game continues until the end of the seventh round, and at that point, the player with the most points wins the game. If there is a tie, the player with the most bonus points wins the game. 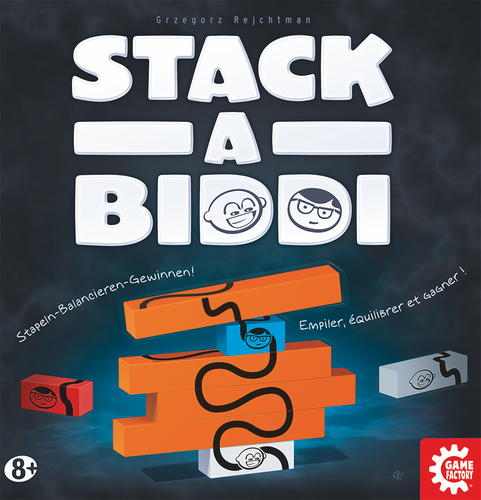 Stack-A-Biddi is an enjoyable family level dexterity game. 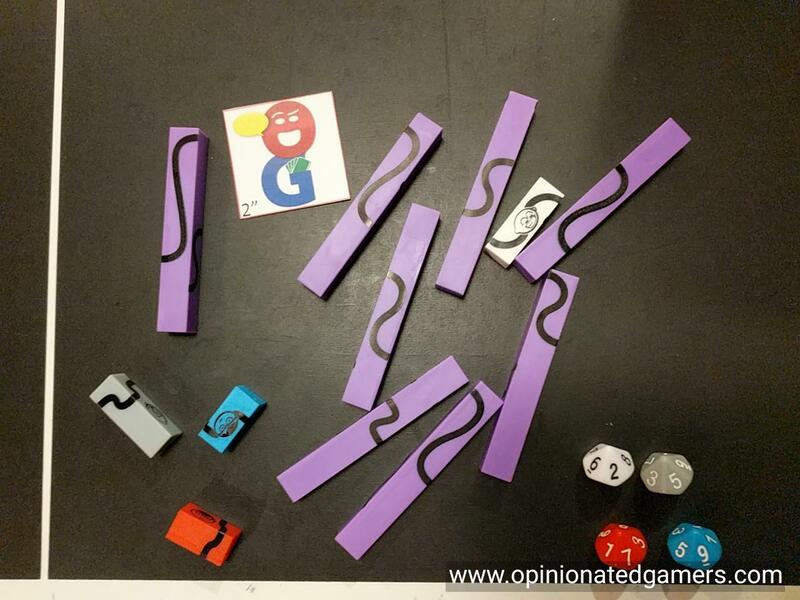 The rules are simple to teach, and as long as you have one player who understands the re-roll rules for the dice, it can be enjoyed by any group. The building itself is simple enough, but there is a fairly decent challenge at choosing the right pieces to get your stack built up while maintaining the connected line all the way up. There is a nice double race element. First, you are simply racing the other players to build as quick as you can without making mistakes. I have seen players win this game without ever winning a single round, but always managing to be no more than 1 level off the round winner. However, especially in the later rounds, you are also racing against yourself trying to get the best orientation of smiley faces on your Biddis in order to try to scoop up huge bonus points if you’re able to win the round. This challenge gives a nice balance to the game between rapid building and careful planning. The Biddis are quite small in size, and getting them in a good location to keep your stack balanced is an important factor in your planning. The rules allow you to balance your stack with your hands during construction, and there have been a few occasions where I’ve been able to cantilever an off-center Biddi stack so that it stood on its own by the end of the round. But, more often than not, when your stack starts to wobble, the plastic tower is coming down before you can catch it! The game has worked well in the family and casual setting, but my all-adult groups have found it to be a little less challenging. With the all-adult groups, players are usually able to build so fast that you don’t have much time to try to plan to specifically get smiley faces in your stack. By the time you’ve done your mental planning, usually at least one other player is already halfway done with their stack. The game instead becomes a simple race with any bonus points really being more luck of the draw than anything else. In this group, we found the game to be more challenging to force us to use the smiley faces as part of the building condition (and just get rid of the bonus scoring). I know I’m usually not one to put house rules on a game, but this is one that has worked for us – without this change, I don’t know if there would be enough here to keep my regular group interested in the game. The game plays quickly, and there are always twitters of excitement/laughing as people struggle to build their tower or when a tower comes crashing down to the table. Like many speed games, someone who is naturally more apt at the game could run away with it, but each round usually lasts under a minute or two, so the whole game experience doesn’t take that long. Make sure you play on a sturdy table lest you have multiple towers crashing down because someone accidentally nudges the table! 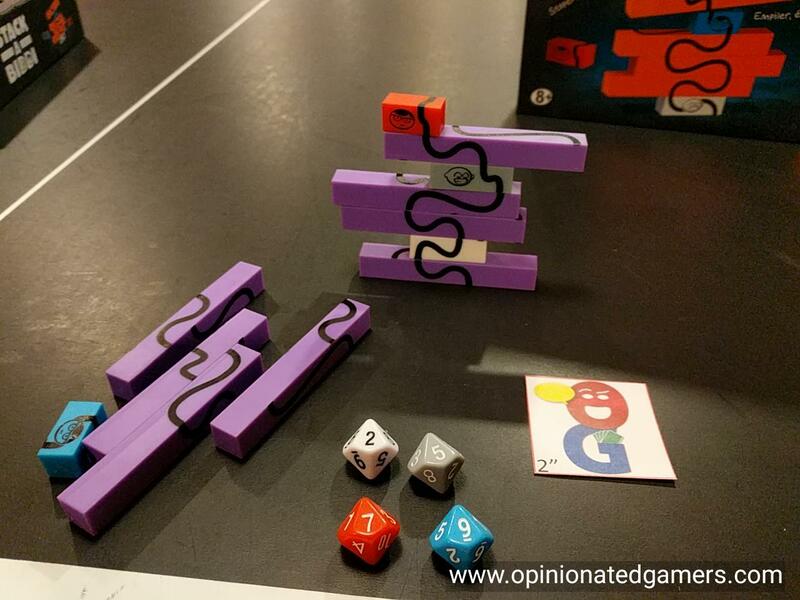 James Nathan (½ play): I played a demo of the first round at Essen. “That’s it?” The demo seemed to end at that, but as there was no one else waiting, I asked if we could try the last round. “That’s it?” In my limited experience it was trivial to align the waves, have the small blocks on the bottom, and the smiles on their faces. “That’s it?” It was admittedly a limited play, but there was such a paucity of drama, that I couldn’t see enough potential to try again.